In the near future, you won't need a smartphone to shoot buzzy Snapchat videos. Snapchat announced on Friday that it was rebranding itself as Snap Inc. and launching a pair of techy sunglasses called Spectacles that will let marketers, creators and users change how they film and post Snapchat clips. Priced at $129.99, the glasses will start rolling out in time for holiday shopping and come in coral, teal and black. The glasses have a built-in, 115-degree camera lens that syncs with the app to let users create and save 10-second video clips. Some marketers see the glasses as a way to increase time spent with the app—consumers already spend 25 to 30 minutes a day in it, per chief strategy officer Imran Khan—and make it the go-to platform for social video. "This will increase time spent and engagement on the platform and create additional ad inventory in Stories," said Jason Stein, founder and CEO of Laundry Service. "Ads in Live Stories and between users' Stories are the most scalable way for advertisers to reach people on Snapchat." Google Glass—a predecessor to Spectacles in tech-enabled glasses—is widely considered one of the biggest technology flops in recent years. Marketing execs say that won't be the case with Spectacles. "If you look at the contrast between this and Google Glass, Google Glass was this esoteric, techno-geek fantasy—that was appealing to a certain part of the population, especially if you had the money to buy a pair," said Noah Mallin, head of social at MEC North America. "The Snapchat take on that is to go the opposite way and trade on the fact that Snapchat right now has an inherent cool factor—it's about their user base." Price, for one thing, is a difference. While Google Glasses cost $1,500 when they came out in the U.S. in 2013, Spectacles will cost $130—not a cheap price for sunglasses, but low enough to intrigue people. "I think that's a really big difference, a difference of opinion," Mallin said. 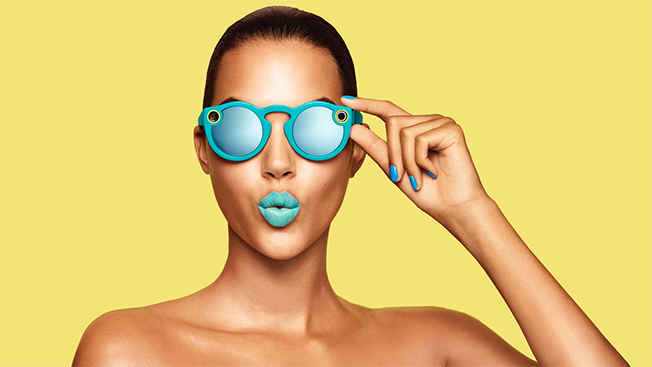 Another difference between Spectacles and Google Glass is that Snap Inc.'s product will only do one thing—create Snapchat content. Using Bluetooth or Wi-Fi, the glasses send videos straight to the app, and if you don't have your phone with you, Spectacles will store them until you can access the app. That's a big change from Google Glass, which did everything from shooting photos and videos to overlaying them on the screen to pulling up maps and directional information and searching the web. Until now, Snapchat has pitched brands to shoot vertical video specifically for the app. But with Spectacles, the glasses capture circular videos—kind of like a GoPro for your face. The glasses footage means that both portrait and vertical mode will fill the screen, depending on how the phone is held. And users will also be able to toggle between portrait and landscape modes to see different perspectives. "As Snapchat becomes a camera company, there is also the potential to use Spectacles as a content capture device and create unique videos for all advertising mediums," Laundry Service's Stein said. "Given that Spectacles' circular video will work in landscape, square and vertical formats, it's likely that brands will embrace them." Spectacles represent Snapchat's first attempt at virtual reality or 360-degree video, which Mallin predicted will eventually become more widely available within both the app's ads and content so you don't need the glasses to shoot circular video. "I think it's reasonable to assume that that format choice is going to be available beyond what you're able to shoot with glasses," he said. "This is them saying that they're very open to how the device and the video format interact beyond just the AR stuff [like lenses] that's happening on the platform already." According to The Wall Street Journal, which broke the story late Friday night, Snap Inc. CEO Evan Spiegel, said the rollout of the glasses will be small at first. "We're going to take a slow approach to rolling them out," Spiegel told the publication. "It's about us figuring out if it fits into people's lives and seeing how they like it." If that's the case, Mallin said, he envisions some of the platform's biggest celebrities—think DJ Khaled-type personalities—getting their hands on Spectacles before the masses. "Having influencers wear something like this and use that to capture the content takes it to another level, and I think there's actually a novelty level because they're talking about this being limited-edition," he said. For brands, working with those influencers to create sponsored content may be their first peek into circular video. "With Google, they made this effort to get it into the hands of tastemakers—I don't know if this will necessarily work the same way," Mallin said. "I think here there's an opportunity for brands to do it in a democratized way because Snapchat lends itself well to midtier influencers."